Building an independent game development team or think-tank for the first time is typically an organic and exciting process. Although going with the flow and letting things happen can be wonderful for the creativity and enthusiasm of your team, it doesn’t hurt to think ahead and plan for your success or failure. Riding the euphoric tide of a brilliant idea may leave you and your team stranded on a desert island! Once the honeymoon period is over and your idea begins to take shape as a viable project or set of projects, it’s time to think about more than your design documentation. This means paying attention to your business and legal relationships and developing some adaptable goals that fit your motives. Don’t misunderstand—developing is your priority, and will always be your priority. It’s frustrating when you’re forced to take time away from development to concentrate on things you simply do not want to think about, like failure. However, anything you invest in, especially when you involve other people, will create risks and possible rewards. Those risks and rewards deserve due consideration and diligence on your part. They will inevitably demand the creation of a business and legal strategy. Thinking about these things early on can save you a serious headache in the future. This article will cover business and legal decision-making from the ground up: who makes the decisions for your project? What’s the purpose of what may now only be a loose cooperative of likeminded individuals? What will you accomplish and how will you evolve? And just as importantly, what business and legal issues should you consider based on your answers? The most challenging question you must ask before you can even begin the decision-making process is, “how do we make decisions?” The more collaborative and organic the team’s origin, the more uncomfortable teams become when discussing leadership. Sometimes leadership occurs naturally—you’ll have a charismatic voice, an “idea (wo)man”, or someone who has championed and spear-headed the project from the word “Go”. On the other hand, a team may be truly collaborative. Everyone will want to have a say in how things operate. In the case of the “key man” situation, there’s a lack of checks and balances. In the latter democratic scenario no one can act as a final arbiter in the event of a serious dispute. Looking at some examples may help illustrate these problems. Illustration One: Mary is a recent graduate from a top notch game development program. She wants to bolster her design portfolio for the sake of her job hunt. To do this, she wants to build a team to develop a game concept she’s passionately yearned to create since her youth. The game charts the journey of Squea, an alien taking the form of a sweet, pink nosed, golden eyed white kitten. Squea seeks out the energy created through joy, which she then converts to charge her spaceship. “Joy points” are earned by finding and cheering up lonely throughout the galaxy. Mary attracts a motley team of developers, including an odd artist cousin or two, but it’s clear to everyone that she is the driving force behind the operation. As the game nears completion Mary’s cousin, Emily, suggests they register the game with the Copyright Office. Mary doesn’t consider this a priority and forgets along the way. Additionally, she fails to include copyright notices on the game’s assets. Because Mary has full responsibility over all aspects of the project, no one else takes it upon themselves to override her. 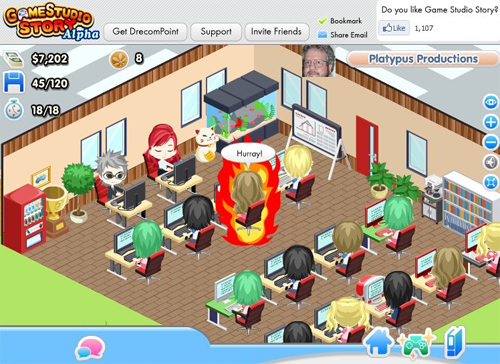 After submitting the game to several game competitions and receiving multiple awards, Mary’s team starts selling the game through digital PC channels. A year later, Emily finds an identical copy of the game ported for free to the Android Marketplace. Furious, she contacts Mary, who subsequently contacts an attorney. The attorney informs the team that although they still own the copyright in the game, their claim for damages may be substantially reduced due to a failure to register the game and a failure to include proper notice of ownership to potential infringers. Emily holds Mary responsible for the sudden dearth of legal remedies and a massive falling out ensues. Family affairs are now tense, and Mary (without consulting the rest of the team) pulls her game from the PC marketplaces. The rest of the team sues Mary, claiming ownership and equal rights to exploit the work. Illustration Two: Bill and Carly started a game developer group on Meetyou.com. Every month, the group meets to discuss programming and design concepts, pitch ideas, and collaborate on a variety of projects. After two years the listed members for the group number over a hundred; some are more active than others, but there are roughly 30 or 40 people who are continually involved in projects developed by the group. IP ownership is never discussed and everyone assumes they own their own contributions. Additionally, several of the members are students or employees. Several of these are improperly using third party licenses in connection with their own contributions. Bill and Carly have taken a “hands-off” approach to this; their motivation is to facilitate idea creation, collaboration, and education, and they don’t want to force rules and restrictions on the group. Bill and Carly wanted to engender a wholesome, developer-friendly environment; unfortunately, a total lack of leadership or guidance in any collective that produces a commercial project poses a legal danger to the collective and its individuals. Several alternatives to the laissez-faire approach taken by Bill and Carly include creating a voting membership of core members, creating a set of guidelines for project management, or formalizing as a non-profit or LLC that assists developers in organizing their own projects. These alternatives may permit Bill and Carly to remain in the background while still engendering the type of environment they hope to create. Both scenarios described above include specific reasons behind the decision to do (or lack thereof). Goals are important. A goal to “make something,” even if you don’t know what, is still a goal. Your goal is the soil in which you will plant the seeds of your ideas—the richer and more substantial your goals are, the greater the likelihood of a good harvest. A goal becomes substantial when it goes beyond “what” and “how” you develop and includes “what happens after we’ve finished?” However, it’s also important that your goals be flexible. This is especially true in the beginning. Finally, it is important that the key players within your team understand the end game and want to accomplish the same or similar goals. Many of your decisions and the way you make those decisions will flow from your underlying purpose. Let’s re-examine the scenarios mentioned above. In Mary’s case, registering the game’s copyright may not have seemed important because she wasn’t thinking of commercial success. She wanted to bolster her portfolio and she wanted to see her brilliant idea come to life. Without discussing this goal with her teammates, she created a high likelihood that her teammates would participate in the project for entirely different reasons. Certain decisions, such as the decision to formalize, determine IP ownership, and establish profit distribution seem unnecessary when the project is a hobby or portfolio builder. However, following through with those decisions is mandatory when you want to create a commercially successful game. Similarly, the decision to not focus on commercial projects is just as important to your decision-making process. Bill and Carly only hoped to bring people together and create a community of likeminded friends and developers. Collectives, start-up weekends, and co-ops are popping up everywhere for iOS, XBLA, and Android/Google game development. The original organizers themselves may seek only to bring people together; they may not have an active interest in making a profit off of the games produced by the collective. In those cases, an entirely different set of priorities and options arise: a group may decide to formalize as a non-profit with a robust IP management and asset distribution assistance program; organize as a for-profit business entity that helps produce and distribute games while taking a commission or fee; or they may elect to create any number of association or organizational models that can provide both financial stability and legal protection for the collective. It’s necessary to work through the process of categorizing and fleshing out your goals before proceeding. Only when everyone understands and agrees upon the best possible scenario can you begin working toward that motive. The next step is putting that motive to paper. When you formalize the design and technical elements of your game, you put that in a document. Your game documentation is the roadmap for your game. Project leadership relies on this roadmap to complete the game. Your team’s collaboration agreement, operating agreement, bylaws, articles of incorporation, or organizing documents all serve the same purpose—they provide a roadmap and spell out how assets should be distributed and managed. Many, many conflicts are the result of a misunderstanding because something wasn’t “spelled out” in an agreement, or because the parties didn’t clearly specify who owns what IP and how profits should be distributed when amazing success happens. Sometimes nothing was written down in the first place. While this may not result in the failure of a project, it may certainly result in the collapse of your team. Putting things in writing is the first step. Keeping those documents up to date so that they accurately reflect the evolution of your projects and your goals is equally important. As with design documentation, you may need to reevaluate what you originally wrote down. For example, if Mary’s team creates a collaboration agreement for their project, they may need to amend that agreement if a member drops out or if a new recruit joins the project. If you have something in writing and check it frequently when things change, you are taking an important step to keeping the peace should your game see financial success. To that end, knowing the assets that you are creating /contributing and putting a value to those assets as they come into being is also imperative. Determining ownership, distribution, and control of the various intellectual properties (including copyrightable content, trademarks, trade secrets, proprietary and prior works) embodied in a project can be a massive undertaking late in the project’s development. For example, in Bill and Carly’s illustration teams are constantly changing and the underlying group is constantly expanding. An adaptable approach can be adopted at the outset to avoid the kinds of problems Bill and Carly experienced. This might include a simplified project documentation form that lists team members, their roles, and their initial ownership interest, which can be expanded upon as the project nears completion. Fleshing out that basic form with provisions that spell out what happens in the event of a teammate’s withdrawal, removal, or replacement also goes a long way to avoiding future conflict. Finally, it’s important to record meeting minutes when new decisions are reached. If a conflict arises after a decision is reached but that decision wasn’t formally recorded in an amendment to your agreements, it’s helpful to have something to refer back to as a means of getting a clear picture. Your agreements let you know how decisions should be made and what decisions are pre-determined. This goes a long way to clearing up future disputes and the legal costs associated with those disputes.